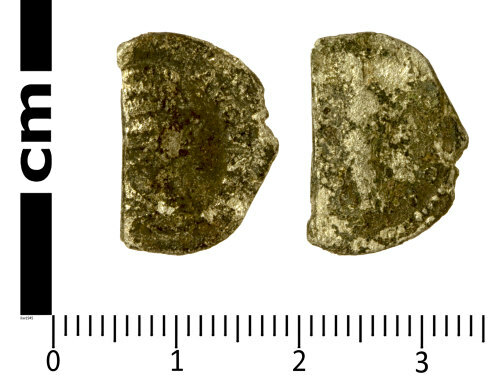 An incomplete Roman silver coin: a broken denarius probably of Julia Domna (AD 194 - 217), dating from AD 203 (Reece Period 10). Probably PIETAS PVBLICA reverse type depicting Pietas standing left with both hands raised in invocation, altar at feet. It is 17.8mm long, 12.6mm wide and 2.1mm thick. It weighs 1.51g. Mint of Rome. cf RIC IV, part I, p. 170, no. 574. Reverse description: Pietas standing left both hands raised in invocation, altar at feet.